Can you hear me now? Not only is that an old Verizon slogan, but it seems to be a recurring issue with me. You see I don’t pay attention to something many times until it is important to me. And it doesn’t mean what you have to say isn’t important, but when it is task related, I tend to tune out until I need to accomplish the task. For example, if you said “Hey could you send me Bob’s address when you get home”, I will say “send me an email/text” because I know that even though it is important to you, my brain is constantly moving so I will most likely forget. This infuriates my wife, who will tell me multiple times what she needs at the grocery store, but unless I am there and talking to her on the phone or she tells me right before I leave, I will most likely forget because I didn’t expend the energy to put it into my long term memory. She now knows to just give me a written list. Now if I could only find that damn list. Week 3 Grand Total of $314 which once again puts us at the max payout of $1500. Pulling out the checkbook now. This is true for my husband. Too funny. My dad thought so much of you. He loved your comics. I heard him speak of Bearman often. Bo Lumpkin was my dad. Christy your dad was an amazing talented man whose spirit here is greatly missed. Thanks for keeping in touch. Ah, a man who no longer wishes to live. I think we all do this to some extent. I know I do from time to time. Don’t beat yourself up. At least you have and active mind. I know some who tend to have theirs sleeping most of the time. I use the “OI Shopping List” app on my smartphone. It’s always on me so I always have it ready to add things and it’s always on me when I’m randomly at a store. Are you one of those body builder types? So does art really reflect reality? Your wife need to get some of those huge post-it notes to stick on you. Ha!!! 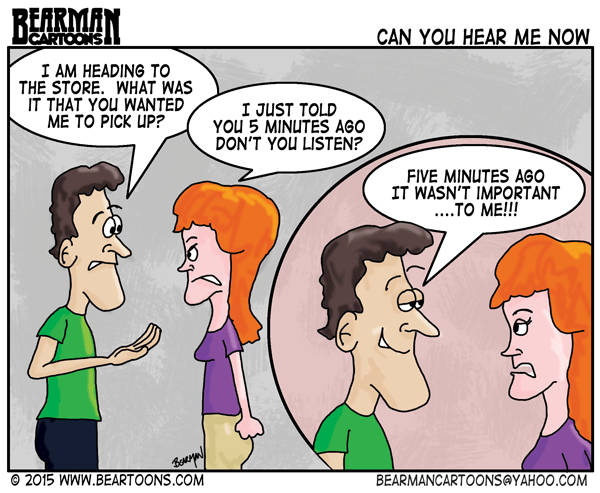 Nice one Bearman & it’s great to know I’m not alone in this. Michelle explains in great detail ‘cos she knows what I’m like but I usually still have to text or call her from the supermarket. It infuriates her too. I just read your comic & post to her & suggested she gives me a note too.Maybe our wives could pin the note to our shirt to cut out the loseability factor? Remember when we were little and the teacher would pin important notes to our mother on our shirt. Maybe We need to recreate that for men. Uh oh. 5 minutes from now he’ll be going alone and coming back alone. I’m finally learning to do this with my hubby too! Every day this week he went out & was supposed to get Thousand Island dressing for a recipe we wanted to make & every time he forgot. So last night I wrote him a big note that took up a whole page & gave it to him before we went to bed. He finally remembered when he got to the store! If you think you’re bad now, wait until you get to my hubby’s age (he turned 65 last month)!